Ludington is known for many things, including its expansive beaches, lighthouses, and the Ludington State Park. 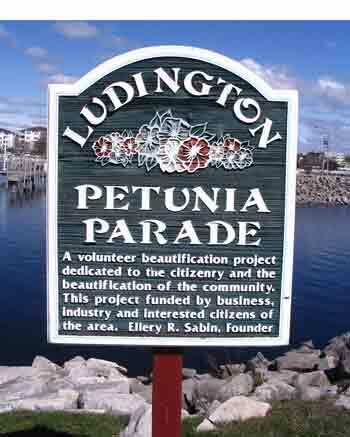 But any visitor to Ludington will tell you that one of the most beautiful sights during the summer is the Petunia Parade.Each spring, hundreds of volunteers gather along Ludington Avenue, the downtown boulevards, and the marina to plant 30,000 red, white and blue petunias, grown by Gustafson's Greenhouse. The Petunia Parade has become an annual tradition, started by Ellery and Sue Sabin in 1987. Petunias were chosen because they are vibrantly colorful, spread nicely, and grow well in sun or shade. 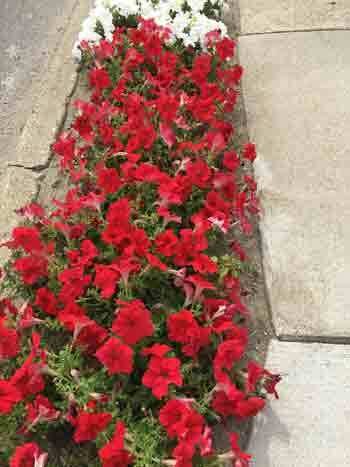 By the time of the July 4th Freedom Festival, the petunias are in full bloom and a wave of color lines the avenue from Spectrum Health Ludington Hospital all the way down to the beach. Each block is assigned a captain who is responsible for making sure the petunias in that block are well maintained throughout the season. From planting the petunias to watering and weeding, it literally "takes a village" to keep this tradition going.